As fans of the band will be used to, they take seeming delight in wrongfooting you, but there’s a lot of depth to it; the cover of The Scientists’ Set it on Fire is sung by Mudhoney’s Mark Arm, and it’s a rumbling delight. David Bowie’s krautrocking Station to Station is subtly sinister in The Melvins’ hands, featuring vocals by early industrial pioneer J.G. Thirlwell that are clearly different from the Thin White Duke but that do the job perfectly. The Kinks’ Attitude is pumped-up and rocking here, while Jello Biafra does a Brian Ferry impression on In Every Dream Home a Heartache, which is eleven minutes long here and oddly creepy. It’s not a perfect album – how many more times do we have to hear bands covering Black Betty? 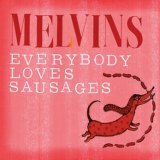 Not that The Melvins do a bad job, far from it (Jared Warren and Coady Willis from Big Business pop up to add extra bass and drums, as they do on three other tracks) but it’s hardly something that we haven’t heard before, unlike much of the album. Still, just one dud on a covers album makes for a pretty excellent covers album, and fans of The Melvins will love this.